The Paps of Jura. Click for hi-res. I laid eyes on the Isle of Jura for the first time last year on my trip to Islay. From the Bunnahabhain distillery, our driver, Uncle Charlie, pointed out ‘the Paps of Jura,’ two mountains rearing up from the southern lobe of that island. (The shot at left is from Caol Isla distillery, just to the south of Bunnahabhain.) We did not make it to the island, nor try the whisky while we were there, but we bought a couple tasters in a whisky shop in Edinburgh. And they are what you see below. 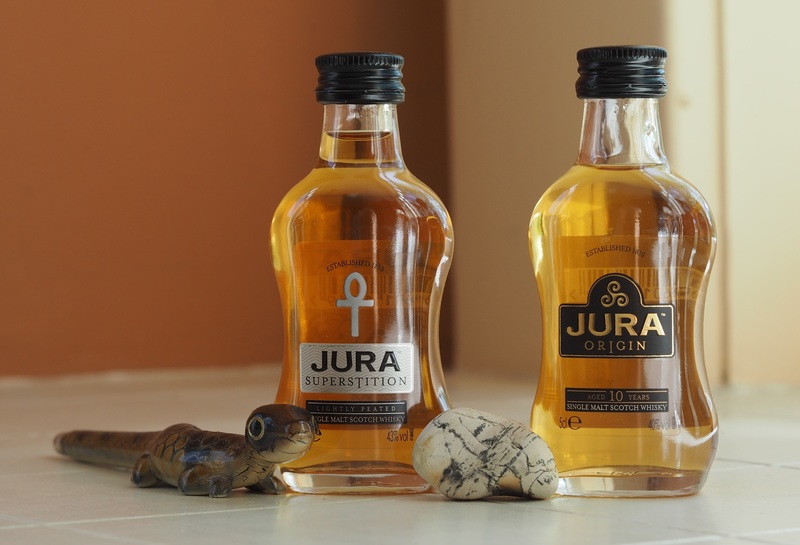 On the left, we have Jura Superstition, a non-age-statement expression, available for $65 in a 750 ml bottle locally. On the right their standard 10-year-old, Jura Origin, which is not sold in the US, though their ‘Island of Jura’ 10 is about $60. As I have pointed out previously, it is common for the NAS whiskies to be priced higher. I’ll discuss the economic absurdity of that strategy in a later post. What does the distiller say about these whiskies? The Jura distillery is owned by Whyte and Mackay, themselves held by the monster Alliance Global in the Philippines. The brand website is accessible and not overdone; the welcome page covers the history and locale (and some of the key personnel). Navigation is straightforward; the hamburger menu gets you to the expressions pages. The notes on each expression are clear and helpful, so bravo for that. Before I begin on the whiskies themselves: I have in the past telegraphed the judgement of a dram I’m tasting. This time, I want to stress that I gave these tasters two chances, a week apart, and had my trusty whisky-drinking wife chime in as a check. Jura Origin 10. Click for detail. The color is light straw; the shot of the glass to the right looks darker than it should. The color seen in the bottle is more accurate. They don’t say a lot about the nose, and they’re right not to do so, as it was unremarkable. You can see below, the palate was okay, but not particularly flavor-forward. Nose: Not too complex; lightweight but pleasant. Malt, traces of mineral, lemons and caramel. Palate: Malt, honeysuckle, light peppery spice on the sides of the tongue, a touch of leather and clove. Certainly is clean-tasting, though that hint of leather gives it a little meatiness. Not much maritime influence; in character, more Highland than Island. Finish: A quick finish of spice (nutmeg and clove); light sweetness lingers longer, pushing past modest tannins from the oak. Bottom Line: This would be alright at $40 – 45 a bottle, which is about where it sells in the UK. A light whisky for those who do not fancy being challenged by their drink. Also would be good on a summer evening. Again, due to the failing light, the color in the glass in the shot at right is misleading, this whisky is not that dark. The Superstition is a shade darker than the Origin, however. 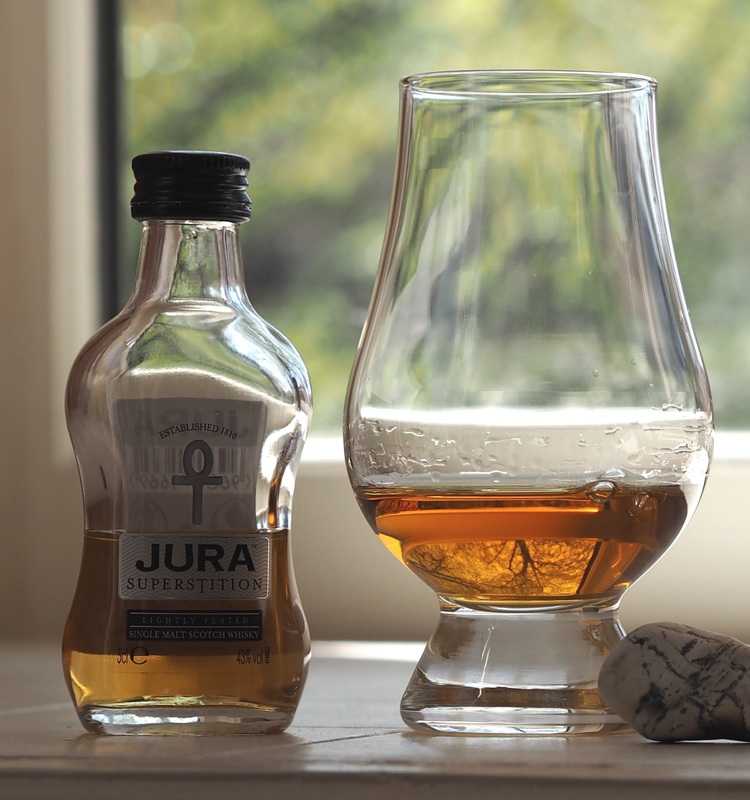 Nose: Alcohol stings the nose even with a careful approach to the Glencairn glass. Beyond that I get the same lemon citrus as the 10 but none of the caramel. The barest hint of peat. Palate: Richer than the 10, toffee carries the sweet side and the spiciness is liveler, peppery as well as nutmeg. Tannins are more forward, and harsher than the 10. Finish: A quick, harsh and unpleasant finish. This stung the throat on the way down, and made my stomach hurt. I’m guessing some young whiskies lurk in here, along with something old enough to give it the midrange punch that the 10 does not have. So where in the world do these guys come off pricing this NAS above their 10-year, and about the same as Caol Ila 12 and Talisker 10, two excellent ‘standard’ Island whiskies? I don’t think a small contingent of older barrels can make up for the harsh youth of some of the spirit in this mix. Whereas Talisker Storm, a pretty good NAS, found redemption with a hefty discount, I would not buy Superstition even at a large discount. It is not a viable single malt. It should be re-thought and reformulated. 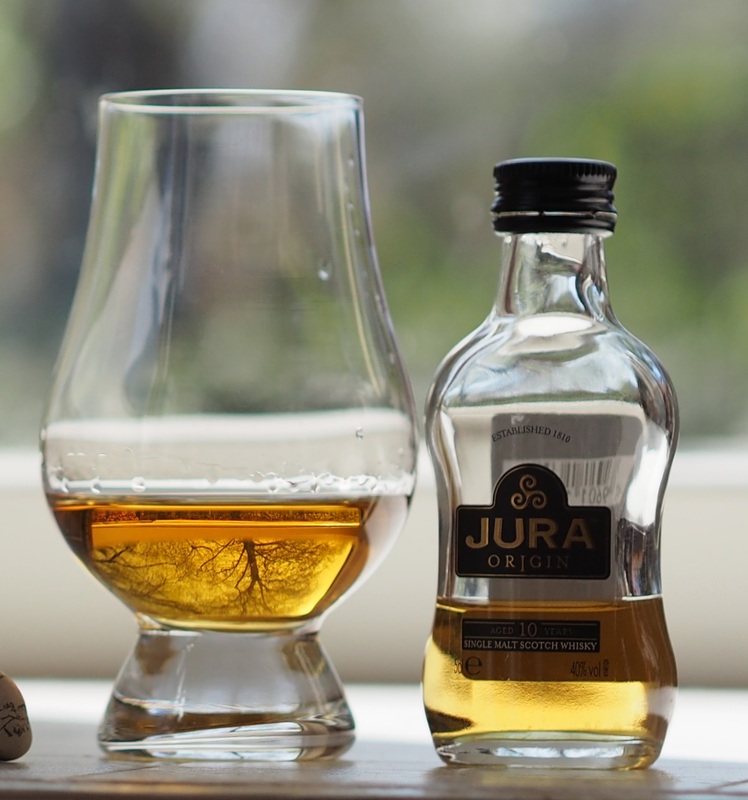 This entry was posted in Scotch-single malt, Whisky and tagged Jura, Jura Origin, Jura Superstition, Scotch whisky. Bookmark the permalink.